This form of China Fir we love for its bright blue vivid foliage. A tall growing conical tree to 40′ eventually. To about 25′ tall in 10 years. 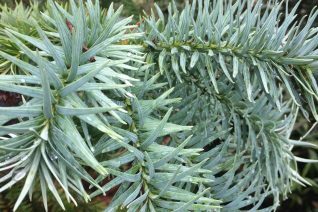 A prickly but beautiful conifer that grows fairly fast when young. The boughs eventually house small, cute, ok, damned adorable little wooden pinecones that persist through spring. In time the trunk becomes gray and fissured. A sky line tree with great age and old specimens dot the Portland Metro area. Very drought adapted when established. Great screen or specimen. Give it plenty of room to grow in FULL sun- no shade and rich to average well drained soil. Very good architectural presence. Cold hardy and easy to grow- long lived tree. Moderately deer resistant.